Hi All and Happy Wednesday, Winesday, or Hump Day! It’s getting HOTT here in Houston, 90 plus degree days but finally no rain! Not only are our summers extremely hot, but we also have about 90% humidity… daily. All this means skirts and light tees for me! Confession: I’ve never been much of a tee shirt kinda girl. Now, nothing against tee shirts… just never been a fan. Some days you can find me in a tissue tee or tank, if I absolutely had a choice I’d wear a graphic (statement) tee daily! Seriously, y’all how fun are they?!?! Dress them up, dress them down. Wear them with fun jewelry or shorts or heels or whatever your heart desires! They are definitely TCE approved! Mine pictured is from Francesca’s and currently sold out, bummer I know! But be sure to check out this one and this one! I’ve also linked more favorites below! Raise your hand if you’re a fan of midi skirts? What about a black, lace midi skirt? (I’ve got both hands in the air!). I love the fit, the length, and the look! This midi skirt has been a great buy! I am able to wear it to work for a professional look or out for a fun and chic look! I must mention these pumps since I do own them in 3 colors! I love me some peep toe pumps 🙂 Once broken in, they are comfy, I promise! Be sure to shop my pumps and other details below! If you missed my IG Monday, be sure to check out Kristin Schmucker Shop for this cute mug! 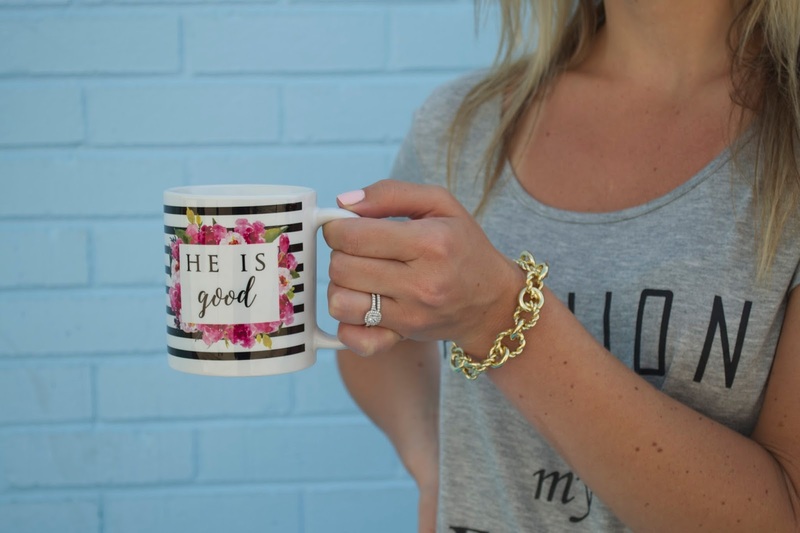 She offers everything from mugs to candles to bible study tools and they are all great! She just released a new line yesterday, too! Find it here! As always, thank you for stopping by! Check back soon for more summer time looks!